THIS PROJECT IS STILL UNDER DEVELOPMENT--USE IS STRICTLY AT THE USER'S OWN RISK! Nineteen-forty was a monumental year for travelers and for the Pennsylvania Turnpike Commission, as cars turned on their headlights and entered into the darkness of Sideling Hill Tunnel and Rays Hill Tunnel. With the opening of these tunnels and an eleven-mile link to the corridor opened and business and economic gains materialized. The corridor served as a crucial link from the east to the west, connecting Harrisburg and points east to Pittsburgh and points west. Now, there was a quick and safe means for transporting raw materials and processed goods throughout Pennsylvania. The corridor not only served as a corridor for goods but also aided in the efforts of a nation at war; World War II. However, by 1968, a love affair with travel and with the automobile created more traffic than this eleven-mile corridor could carry. The traffic congestion created by the bottlenecking at the two-lane tunnels was largely beyond the imagination of the projects designers and by 1968 a new plan had been executed. 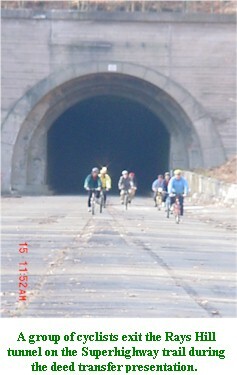 In that year the Pennsylvania Turnpike Commission opened a bypass around these two tunnels and this eleven-mile corridor. Not only did two tunnels lay dormant after this closure, but so did the Cove Service Plaza. After its closure in 1968, the Commission sought to get further use out of the property. Over the years the property served the Commission in an array of ways. The site served as a tactical and firearms training site for state police Troop T, the Commission’s maintenance crews trained there, and several research and development institutions conducted studies in the tunnels. The shoulder rumble strips that adorn all major highways in the nation were tested and developed there. Even highway reflectivity regulations have a beginning here, where reflectivity tests were conducted in the absolute darkness of Sideling Hill Tunnel. Throughout the years of dormancy several film companies have considered Sideling Hill for movies and the US Mint considered it for storing currency; another Fort Knox. It wasn’t until November 15, 2001 that the Sideling Hill Tunnel measuring 1.33 miles long and the Rays Hill Tunnel measuring .75 miles long would get a new owner and a new use. 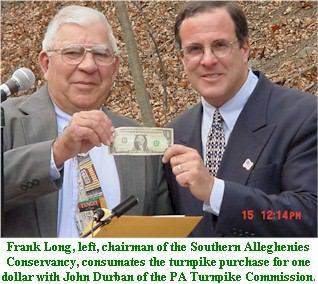 On that day in November, the Southern Alleghenies Conservancy (SAC) acquired 8.5 miles of the property for developing a nonmotorized recreational trail. The picturesque 8.5 miles of highway, which is situated in secluded, yet accessible, portions of Bedford and Fulton Counties, is home to a diverse and large population of wildlife. For years the property anxiously awaited redevelopment and longed to tell the story of its Industrial History which included the Pennsylvania Turnpike and the South Penn Railroad. Now, the once gated property will be accessible to the general public. 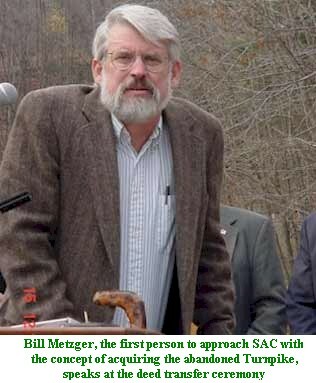 Thanks to Bill Metzger and SAC outdoor enthusiasts will have the opportunity to explore the nation’s history and enjoy the scenic beauty of rural Pennsylvania. SAC hopes to conduct and complete a business, site management, and feasibility plan for the project by the summer of 2004. “The property has great development potential, both economically and recreationally and no one is denying that. We realize that the current sentiment is that the project is moving slowly, but funding such a large project is difficult especially in the current political and economic climate. SAC is committed to the project. One day our work with this project will be as instrumental as our efforts that facilitated the purchase of the Manufacturers Water Company, of Bethlehem Steel,”commented Branden Diehl project manager. Not only is SAC striving to create a travel and recreational destination out of this resurrected property, but they are also working hard to conserve its resource. SAC has enrolled the property in the PA Game Commission’s Safety Zone Program, enrolled for a forest management plan, and are working with the PA Game Commission and Department of Conservation and Natural Resources (DCNR) to enhance wildlife habitat along the trail. SAC encourages anyone that is interested in the project to contact them and express their idea. The trail is not officially opened, but will be accessible to the public for hunting access and for future recreation. The PA Game Commission and DCNR are currently patrolling this area and enforcing trail regulations. Click here to see pictures of the trail!